Amy's mom's wedding is fast approaching - and where better to find the perfect bridesmaid dresses than on a spontaneous trip to Paris? It seems that nobody has time for thirteen-year-old Amy these days! Her boyfriend, Seth, is preoccupied with his mom's health. Amy's dad barely knows she exists after her half-sister is born prematurely (thanks so much, Amy, for getting your stepmother to the hospital on time!). And Mom is having meltdowns about her impending wedding. So a whirlwind trip to Paris with Amy's cool teenage aunt, Clover, couldn't come at a better time, especially since the school's French class (and Amy's beau) happen to be there as well. Now why wouldn't her boyfriend enjoy having Amy track him down by GPS and surprise him in the City of Light? Hold on to your beret, les filles are on their way! Sarah Webb is the author of several novels for adults, including Always the Bridesmaid and Something to Talk About. 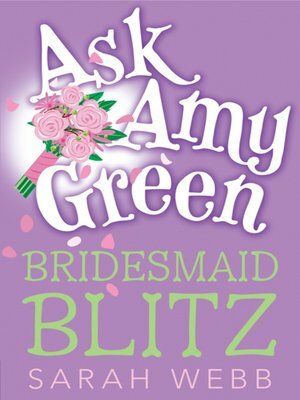 Ask Amy Green: Boy Trouble was her first book for young adults. She lives in Dublin, Ireland.